Exercise and strokes: What is safe? Half of parents driving their children to UK primary schools live under a mile away, walk-to-school campaigners say. The charity Living Streets says the numbers walking to school are falling. A survey of 1,000 parents it commissioned from YouGov found that one in four parents said they did not consider walking their child to school. However, four out of five said they had walked to school when they were young. Schools across the UK are marking walk-to-school week. The National Travel Survey for 2011, published last year, showed that 49% of children aged between five and 10 walked to school. That was down from 53% in 1995-97. At secondary level, 39% of children were walking, down from 42%. Living Streets says walking to school is an easy way to build exercise into a child's day. Its survey found half of those who drove their children to school lived less than a mile away. The group says a one-mile walk typically takes about 20 minutes. 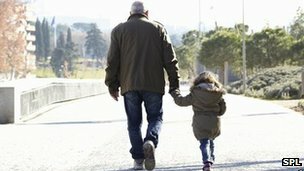 The charity's chief executive Tony Armstrong, said: "The overwhelming majority of our grans and granddads walked to school, but over generations we are seeing a steady decline to the point where it seems a fifth of parents wouldn't even think about ensuring their child walks to school. "Meanwhile obesity rates have more than doubled, even since I walked to school just 20-odd years ago." The charity is calling for more action from central and local government - and parents - to get more young people walking. In Hertfordshire, it says a pilot scheme it was involved with, funded by the Department for Transport, led to more children walking. Tactics included offering incentives, such as badges or stickers, to children who walked to school, plus promotional events. A "park and stride" scheme was brought in, where parents dropped their children at a place close enough for them to walk to school with a teacher or other nominated adult. The campaigners also worked with parents to find out what was stopping them from walking and to find solutions. Time pressures, distance and fears of dangerous roads and "stranger danger" are often given as reasons, they say. Another project, with the Department of Health, urged parents in England to "walk once a week" to school with their children. Living Streets says walking to school should be a key element of government strategy to encourage people to be more active. Chief executive Tony Armstrong said: "We hear a lot from the coalition government about investment to encourage participation in sport, but it overlooks this very simple and cost effective intervention. "Encouraging the walk to school not only helps to keep children healthy today, but makes for healthier adults in the future." In a report just published, the charity says the government "must try harder" and calls for a "strong national focus on walking and active travel". It praises the coalition for its pledge to promote "sustainable travel initiatives" including cycling and walking, and for the ring fencing of money to develop local sustainable travel. But it is critical of the scrapping of regulations which meant schools' travel patterns had to be tracked and says there is "little sign of any coordinated approach or direction from government on a chunk of travel behaviour which impacts very strongly on both carbon and congestion". Transport Minister Norman Baker said the government shared Living Streets' desire to get more children walking to school. "As the report mentions, our £600m Local Sustainable Transport Fund has supported schemes up and down the country, many of which include elements which make it easier for children to walk or cycle to school," he said. "The report also calls for joined up thinking across government departments - this already happens and I would welcome more. My officials work closely with colleagues from across Whitehall on issues that are of interest to more than one department and encouraging children to walk to school is one of these." The Yougov survey was of parents of children aged from five to 11 and was carried out online between 1 to 6 May.